Originally introduced back in Studiometry 5.0, the Custom Summary feature is one of the most powerful parts of Studiometry. This window gives you the ability to sort, filter, and view almost any piece of information in your Studiometry database, but the power and flexibility of the also makes it fairly easy to miss something. This post will give you a quick look at a few commonly overlooked settings. 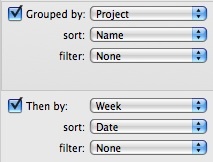 Each Grouped By tier gives you filtering options. If you have a tier for Projects, you can select categories of Projects to show, or even select a specific set Projects for the summary. 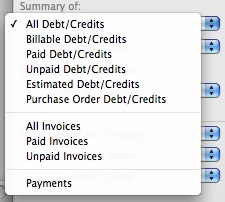 Filters also give you great capabilities if you’re using a Debt/Credit type tier. You can have a summary that only shows hourly work, or a summary that shows all expense items on in progress projects. That last area we’ll go over here is the “Summary Of” menu. This menu gives you the option to show the different modes of Debt/Credits, and also gives you the ability to have the summary generated based on Payments or Invoices. This menu is commonly overlooked, but very useful when creating summaries. Also, don’t forget that any custom summary you setup can easily be saved for 1-click access later! Just use the Save button near the top of the summary options and select “To Presets.” Your presets appear in the Summaries menu and can be accessed easily from anywhere within Studiometry. Studiometry 6.1.2, a free update for registered Studiometry 6.x users, is a sizable update to the already robust 6.1 release. New to this version are several new template tags, settings to include taxes in reports by default, and several other changes. Full version notes are available via the Version History link below.